Everything we do in our class is hands-on, but especially on the day we study the sense of touch! We explore a wide variety of textures, and learn how to describe with words all that we sense with our hands and other touch receptors. Use your sense of touch to “see”: Put items in an opaque container and have kids reach in, feel it, describe it and try to identify it. Container options: something as simple as a pillowcase or a tube sock will do. You could also use a Pringles tube, put a tube sock over the end, and then cut a hole in the tube sock that they can reach through. Or a Kleenex box where they put hand in the opening without looking.Optional: you could have pictures of items (or actual items) out on the table and have them reach in each container, choose an item and explore it by touching without looking then match the item they can feel with one of the items they can see. You can use obvious items (a spoon, an apple), less obvious items (a grape, a marble, a bouncy ball), or specific shapes (magnet letters).We had a game for this, called Touchy Feely. You can get it at Marbles – the Brain Store. Or just create your own! 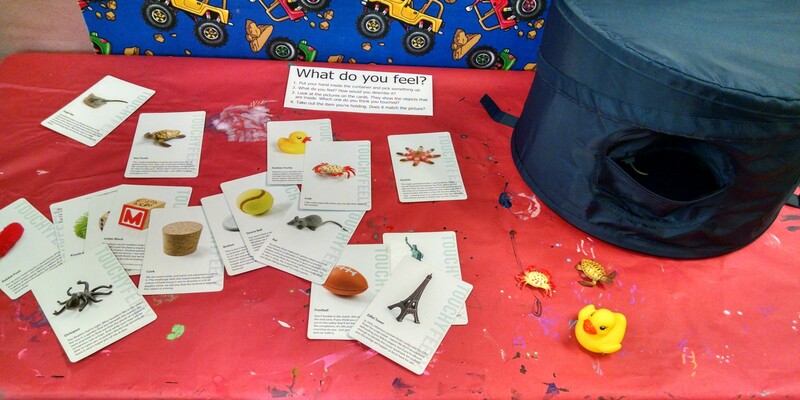 Textures table: In previous years, we set up a wide variety of objects for children to explore. 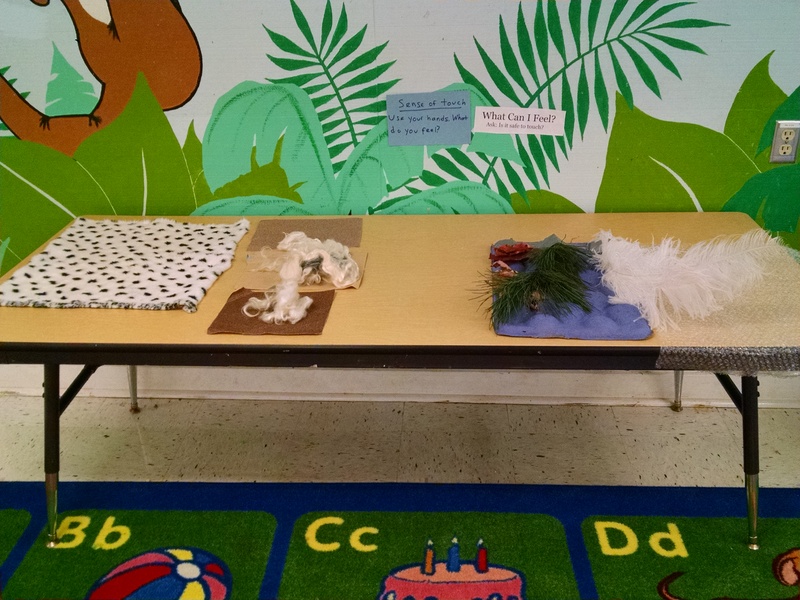 Ideas: fur, fake fur, feathers, bubble wrap, pine needles, wool, and sand paper. I found a collection of balls that all felt different: nubbly, smooth, hard, soft, squish, cold, warm. This year, we made a “sensory board“. Click on that link to learn about it, or check Pinterest for LOTS more ideas. Texture gradients: Get several different grades of sandpaper. Have children put them in order from roughest to smoothest. Sanding Wood: You could then have them use sandpaper to sand rough wood to smooth. 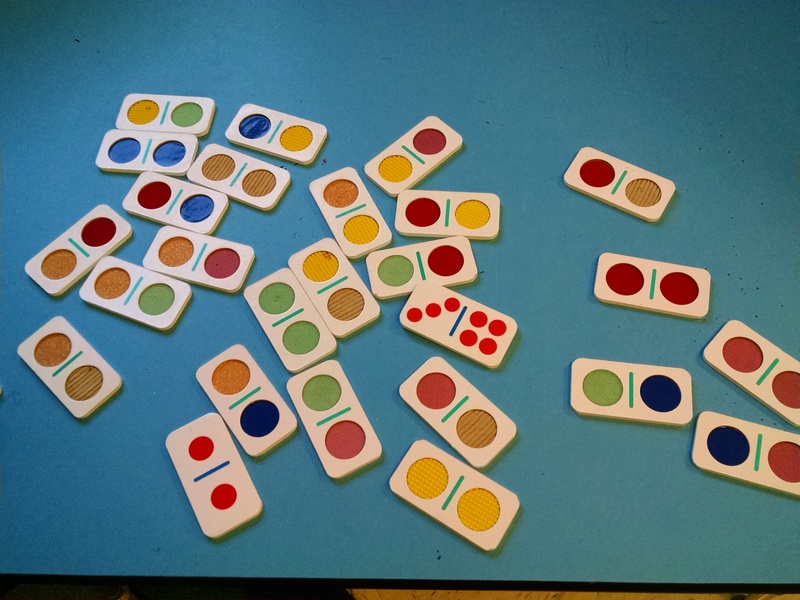 Tactominoes: These dominoes were in our classroom. I can’t find them to buy online – it looks like they might be from Discovery Toys in the 1990s. You could make something like them… In each circle, there’s different textures: sandpaper, corrugated cardboard, fuzzy felt, smooth plastic and so on. Sensory bowls: You could fill several bowls with different sensory materials (rice, pinto beans, split peas, and so on) and have kids plunge a whole hand in and describe what they feel, then try another bowl and describe how it’s similar or different. Temperature: Explore temperature sensations by putting their hands in warm water and ice water. Or wrapping their hands around a metal container with ice water in it, and a coffee cup full of hot water. This would also offer an opportunity for a safety talk – when you think something might be hot, approach it slow and cautiously so your sensors can warn you if it’s too hot to touch! Braille: In our classroom, we had some great resources we just weren’t able to fit into our one day on the senses. We have braille alphabet cards and a braille children’s magazine and more that would have been a fun texture exploration, but also an opportunity for education. Crayon rubbings. You can tape any textured but relatively flat object on the table, then kids can lay paper over it and do a rubbing. Texture Collage. Gather a wide variety of interesting textured materials, and let them design their own collage. Can only your hands feel things? When we teach about touch, it’s easy to create a misconception that only our hands feel things (especially because only our noses smell, only our tongues taste, only our ears hear and only our eyes see.) Talk about this with kids, then demo it: can you feel when I touch your head? when I tickle your tummy? when you eat food, can you feel it on your tongue? when you get something in your eye, can you feel it? You could play a game of placing an object on the child’s back and having them guess what it is. Our sense of touch protects us: Our sense of touch tells us that things are really hot so we know not to touch them and get burned. If we lightly touch a knife blade, touch warns us it’s sharp so we know to move our hand away, not press against it. When we climb up stairs, touch tells us when our foot has reached the next stair, so we can adjust the way we are moving our muscles so we don’t fall. If we couldn’t feel things it would be very easy to get hurt. Gather textures: On our outdoor hike, we asked them to touch a wide variety of things: rough Douglas fir, fuzzy red cedar, soft moss, serrated sword fern leaves, sharp holly, and so on. They gathered items from the forest floor that were interesting textures in a basket – lots of pine cones, some sticks, some dead leaves, and we took those back into the classroom to talk about more. There’s lots more great ideas on Neuroscience for Kids.